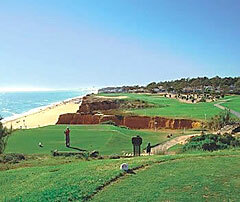 Your local Algarve experts for all courses. Same day or advance bookings- singles or groups. BOOKING GOLF FOR OUR CLIENTS FOR 25 YEARS. These two championship level courses are of excellent quality. Green fees include buggies. 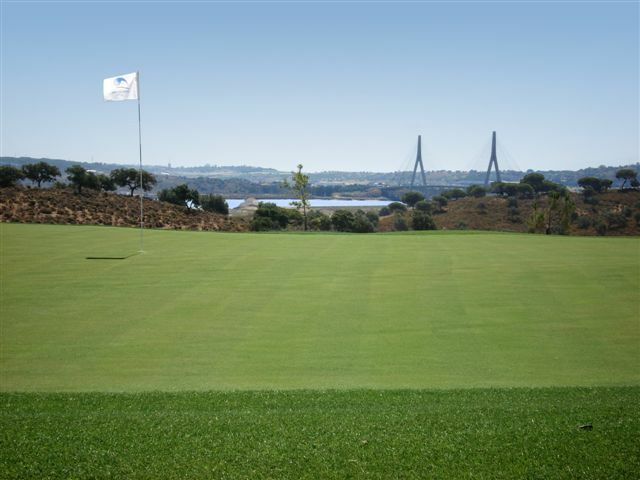 Situated on the Guadiana River between Portugal and Spain, just to the north above Castro Marim Course and town, 3 kms North of the A22 / E1 motorway. Turn off the A22 at the CASTRO MARIM exit ( last one before the bridge and Spain) turn left towards JUNQUEIRA( North) at the 1st Junction, (away from the town of Castro Marim) Follow up approx 3 kms. Look for a small sign to quinta do Vale on the right..take this turn and follow signs to clubhouse. 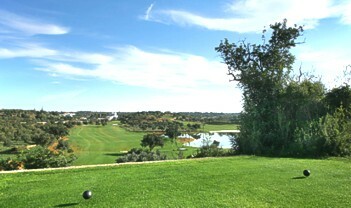 Brand New Course in the East Algarve. (as at 20th March 08) still a little rough on the fairways and edges, greens good. Generally a very interesting course..water features designed to catch you out, and make you really think about laying up or 'going for it!'. Low handicappers and/or long hitters will love it. The rest of us will buy extra balls. Unusual mix of par 5 ( 6 of them) and tricky par 3's make this a very tactical course. With a nice country setting, this is a course to try once..and then go back again ( and again?!) to correct your mistakes! Water features on many holes..so take spare balls. Buggy recommended as it is a long course with highs and lows. Take Exit 17 from the A22, ( Monte Gordo), follow 2 kms down to the EN125, turn right ( Toward Olhâo/ Tavira), through 2 roundabouts, (total approx 4 kms) , through the town of 'ALTURA' , and just after, take the (first or second sign) turn right to Vila Nova da Caçela. In the centro of the small town, at the crossroads, turn left, and follow the Golf/MontRei sign inland. 4 kms down the road is the entrance gate to the Estate. Spectacular new course by J Nicklaus. 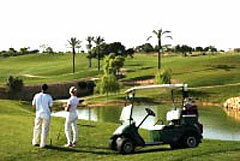 Designed as an exclusive course, with prices to match..buggies included in the price, as is valet parking and bag drop. Free driving range for clients use only... 15 Minute intervals, and separate holes mean you will be playing in your own 'space' without pressure, and no-one else in sight. In excellent condition already, and will get better. Some tricky holes, and a lot of water to cross..or avoid...but fairways generous and bunkers have a 'run off' to always leave a forward shot...greens can be tight, but fast. Bring handicap cards..and be dressed for golf, as the management are vigilant, and require clients to adhere to golf dress, etiquette and manners! Take the last exit before Spanish Border from the A22 Motorway, follow the golf signs around the village and up the hill to the club. 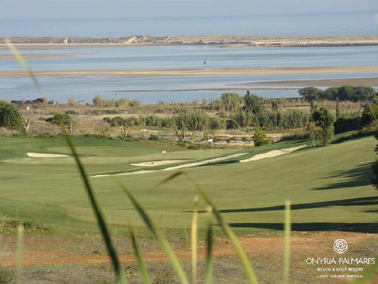 On the first 18 holes you will have breathtaking mountain, river and sea views. These views are part of the spectacular scenery to be enjoyed by those wishing to take walks through the surrounding countryside. (toward Montegordo), and at the next roundabout, benamor is on the left. 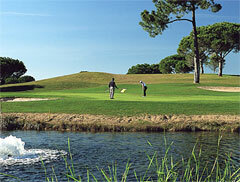 Benamor is a lovely course just five minutes out of Tavira on the EN 125. It is in excellent condition with testing par 3’s, a lovely friendly clubhouse, is easily walkable and an open course. Two sister courses from the same clubhouse, Q Ria is the scenic route to the sea and back, whilst Q Cima is the inland course which is considered slightly harder. Both courses generally in excellent condition, wide open views and not yet squeezed by any development. A joy to play either, highly recommended. Off the EN 125, going towards the airport, 1km approx, before Patacâo t.lights, just after the Sumol Factory and Euroaço(steel) warehouse, on the right, is a road to the right signed LUDO, turn in right here and follow for two kms. 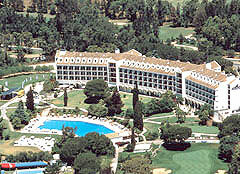 This Now 18 Hole championship course of 6500 meters par 72, 5xpar, 5, 8xpar 4, 5x par 3, along lakes, pines and orange trees. Openes 16th Feb 2009 Penn and Bermuda grass. Turn off the EN 125 into Almancil, follow down signs to Vale do Lobo (West) or Quinta do Lago ( East). At the third roundabout turn right into the golf club. 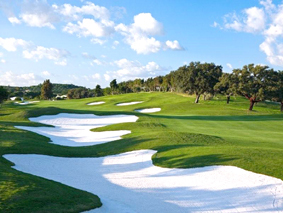 Both courses are set in the luxury estate of Quinta do Lago, Buggies are recommended as the course meanders between the areas of the estate. Some beautiful holes, the coursse are well kept and offer all golfers some excellent challenges. Well established courses. Off the EN 125 at Almancil. Through the town heading south to the sea, follow signs for Vale Do Lobo . Into the estate through the main gate, golf reception is about 500 mtrs on the right. Set in the luxury Vale do Lobo Estate, these two courses wind through the development down to some spectacular costal holes. Both courses are excellent quality golf, with plenty of challenges for every level. The signature hole, the 16th on Ocean, is across the beach ravine and demands steady nerves. Buggies are required on the Royal before 10.30 am. Buggies recommended as the courses are long and fairly hilly, with some walks between holes. Handicap certificates required on both of these courses. Note Buggies €65 Royal required for non members playing prior to 10.30. From the EN125 take the Quarteira turn just to the West of Almancil follow road for 4 km. Vilasol is on the right. Turn immediately right for the clubhouse and Hotel 2 Kms. 27 Holes of excellent golf,some challenges, some water, and plenty of space on the course. 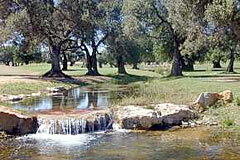 Close to the Vilamoura courses, on the Quarteira road. This is always an enjoyable round of golf on a well maintained, established course..
Everyones favourite, and hard to get tee times on. 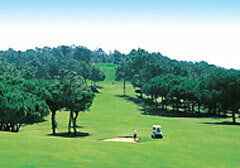 Winding down through pine trees and giving any golfer a beautiful view of the original Algarve course. Sometimes tight shots through the trees, but always onto generous fairways. This course sometimes gets slowed by the sheer volume of players, but is always worth playing. Out of the same clubhouse, these courses are designed to be totally different to each other. Millennium generally has wider, more open holes throughout, although a few tighten up through the pine trees. 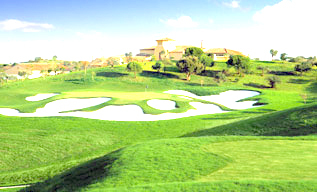 The newest of the Vilamoura courses, designed by Arnold Palmer. This course has a game for every level of player. Some double approaches allow for big and short hitters, the holes all have different features and tricks, and will give anyone a good game. Fairly level and spacious,the course starts easy and ends tricky! Into Vilamoura estate from the EN125 follow marina signs onto the dual carriageway, keep a look out for signs on the left of the road. Follow the signs through the estate to the course. 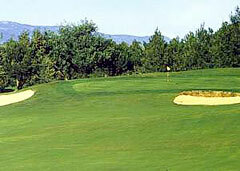 As the name suggests, this course winds through pine trees, but without squeezing the shots too much. In the centre of Vilamoura, it is surprisingly spacious and demands accurate drives to keep out of trouble. The course is fairly level and has some tricky bunker placements to catch the unwary. 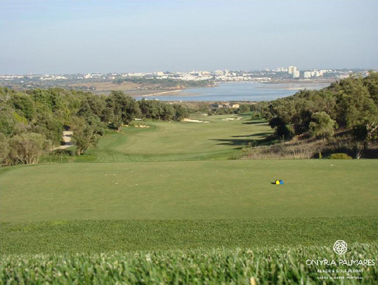 This is the only true links course in the Algarve, water on most holes, it is often mistakenly seen as a difficult course, in fact the fairways are often more generous than one would expect. Some wayward shots will dissappear into the water, and this may push up the scorecard. The afternoon onshore breezes can also make this a difficult course when windy. A new clubhouse and renewal works will improve the course, especially in the wetter periods when it tended to be boggy in lower areas. Excellent value links golf. 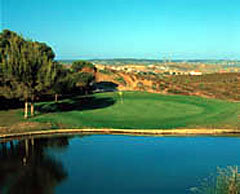 Just to the West of Lagoa on the EN125, turn off near the Slida and Splash Water Park, follow golf signs. Two courses, now each with it's own clubhouse for check in, set just to the West of Carvoeiro. Both courses of excellent quality, and although some parts have been overdeveloped, and the houses impinge on the golf, definitely worth playing. Some parts are quite steep so buggies are advised. Set in Olive groves and valleys. turn off en125 beside International school. thru dodgy cross road...keep going straight on for about 6kms, over the motorway and thru nurseries.narrow road keep going! My Personal favourite excellent value Shortish, but pretty course, Par 71, buggy advised as it can be hilly. It has some excellent holes to play and is a very scenic country course which meanders through the hills and olive and pine groves, just south of Silves. Halway between Portimao and Alvor on the coast road. From Alvor turn east and follow the main road past the private Hospital. A simple par-3 opens your round but it is not an indication of the ease of playing this course as it is considered a good test of a player’s ability with strategic bunkers, dog-legs, elevated greens and many well placed trees. The par-5 on the sixteenth that is one of the longest holes in Europe. Follow the EN 125 towards Sagres. As you approach Lagos follow the signs to Meia Praia. If you miss the small sign and arrive at a roundabout over the bridge, do a full circle of the roundabout and return over the bridge. Take the 1st turn right at the sign post to Meia Praia and follow the signs to the left at the next roundabout. Continue straight ahead at the next roundabout, the couse is at the far end of the beach. This is a superbly scenic course , And will soon have an extra 9 holes ( June 2011). The old course has been redone and is worth playing. just to the East of the historic town of Lagos, and blending beach and mountain scenery. Its clubhouse, set between the ninth and tenth holes, has one of the best panoramas over 180 degrees of the Atlantic coastline. 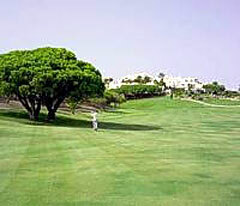 An excellent level of maintenance, the course has both links and fairways with the two types of landscape. From Portimao, take the road for Monchique, passing under the A22 motorway. Or Come off the Motorway at the Portimao/Monchique sign.. In 1 kilometer turn left at sign for the golf. Then follow signs for 3 kilometers to clubhouse. Two new courses to the north of Portimao on the road to Monchique. Morgado is set in a large estate with undulating land and small valleys and now has deep agressive bunkers especially on the 18th hole. The approach shots must be accurate to avoid the steep faced bunkers and the large greens need good putting skills. 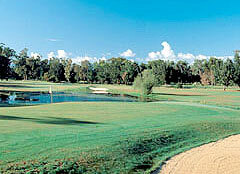 It is a long course to challenge the big hitters and has generous fairways. 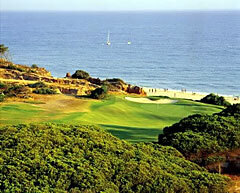 ALAMOS, a new course through the hills then onto a plain, where the holes meander around each other. Still a little 'fresh' as the course opened Feb 2006, the tees and greens are perfect, but fairways and edges still need attention. An Interesting course and well worth playing. 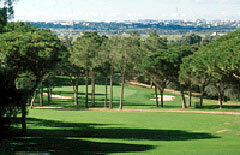 Built by Sir Henry Cotton in 1966, the original Algarve Course. Built on flat land, with water and bunkers to catch the wayward hitter. It has been extensively modified, and replanted over the years. Wide Fairways and some tricky corners make this an interesting course. Everybodies favourite 'original' course. We love it! Take Exit 2 off the A22 and follow signs to Sagres on the EN 125. On the 125, after only about 1 Km, The entrance is on the left. Look for the nets of the academy on the top of the hill. Large signed entrance. 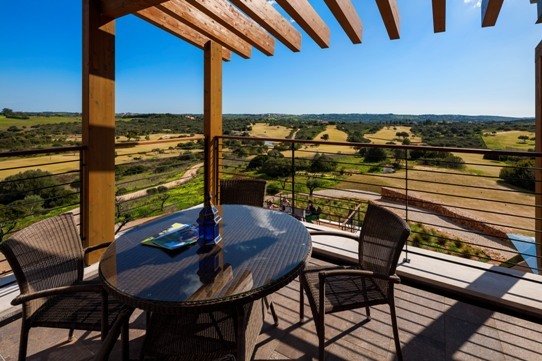 Situated on a headland between Lagos and Praia da Luz, with magnificent views of the bay of Lagos and the Monchique hills. 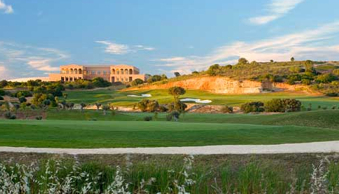 The course is in two sections, the holes near to the entrance of Boavista Resort are part of the estate Holes 5 to 12 have a more traditional and natural presentation as they are on an environmentally sensitive area. A number of the plants and wildlife in this section are protected and great care has been taken during the construction of the golf course to blend the layout without damaging the natural beauty of this cliff-top location. Take exit 2 off the motorway and signs to EN 125 and Sagres. Follow EN125 towards Sagres for 14 kms. The first hole is a 312m par 4 which curves east, a long hit for those wishing to reach it in two. The first nine ends with a degree of difficulty, one's third shot to the green must go over a stream. On the second nine, the highlight is the 11th, whose green is well protected by water, and finally the 18th, which ends right beneath the clubhouse. 9 holes double tees and greens. Nice Practice course. On A22 take exit 1 to Lagos Vila do bispo. down to en 125. head west to Sagres/Vila do bispo. Watch for golf sign at Espiche village.. thru village follow old road west, out of village follow on narrow road approx 4 kms to golf entrance. 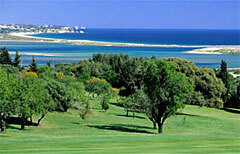 The newest Algarve course. 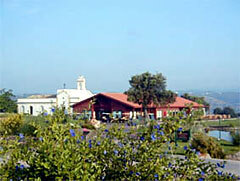 located between Boa vista and P Floresta on the West coast.Clubhouseclubhouse is complete and has the usual amenities. Tricky to access from the EN125, follow signs inlad through the ESPICHE village. Good course bounded by scrub, so lost balls stay lost...some tight fairways need accuracy, others you can let rip on. Fun to play and surprises on many holes. A few blind holes where you have to hit over the mound, and pray...buggy recommended. Greens good quality, but slower than you think.... Worth playing...currently excellent value.